Mikhail Khokhlov was born in Moscow. In 1974 he finished Moscow Gnessin Special School and later in 1981 he graduated from the Moscow State Tchaikovsky Conservatoire (studying with V.Gornostaeva). Then he did an Assistance Fellowship course there, graduating in 1983. He attended symphonic conducting classes by Yuri Simonov and Dmitry Kitaenko. After graduating from the conservatoire he toured as a concert pianist within the Soviet Union, Great Britain, Austria, Germany, Israel,USA. Since 1987 he had been working in Moscow Gnessin Special School of Music as a teacher, later taking the position of Deputy Principal in 1988, and in 1989 he was elected as a principal of the School which he remained up to the present time. In 1990 Khokhlov created first Russian youth concert orchestra by organising the Gnessin Virtuosi orchestra out of the students of the School. He has been directing and conducting the orchestra for 25 years. The orchestra participates in philarmonic concerts, music festivals, prestigious international projects. It performs abroad as well, touring through Europe, Asia and USA, and it became a winner of the International Competition of Youth Orchestras in Spain. Since the moment of creation the Gnessin Virtuosi orchestra has recorded more than 30 CD and DVD, gave more than 750 concerts having more than 600 young musicians overall. M.Khokhlov is one of the organisers of a well known competition for young musicians called “The Nutcracker” (he was an artistic director of the first four competitions), the creator and a member of the soloists ensemble named Piazzolla-Quintett, the author of an idea and artistic director of the art festival “January evenings” in Pushkin Museum. 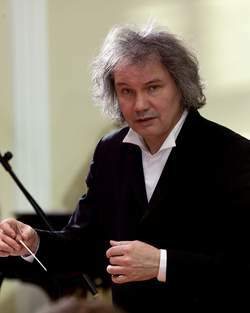 Mikhail Khokhlov is the author of more than 40 transcriptions and arrangements for student orchestras, the initiator and the performer of a number of other methodical projects aiming for the development of childrens’ creative abilities: a movie series “Music in pictures”, “Concerts with Comments”, and multimedia tutorials helping students and teachers of music schools.